...it's just waiting to be discovered! But you have to go out there to see it. we're going out in the FROSTY air. Gonna find us some MAGIC! They look as though they've been dipped in sugar. Right there at the end of the stem. Look closer, there are more! Tiny perfect hexagonal (six sided) ice crystals. "They grow, beginning with a tiny nucleus, and developing around this nucleus a geometrical pattern of amazing regularity. 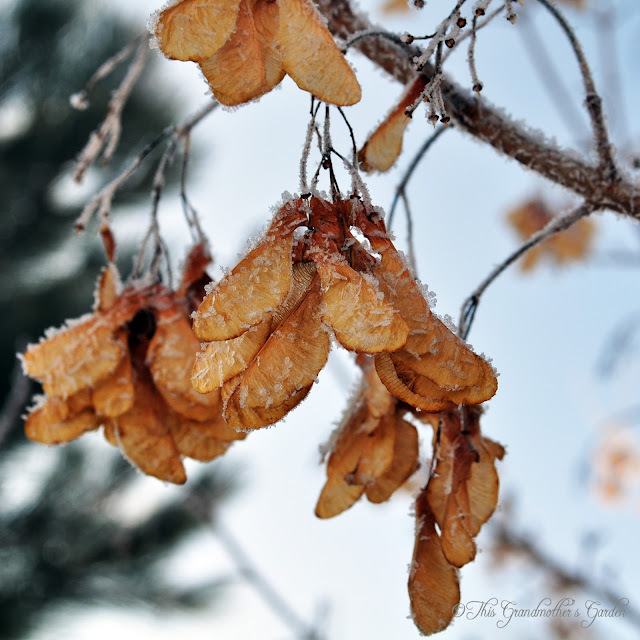 Usually they're hexagonal; they have six sides or six branches. And the six sides will be exactly the same, even to details which can be seen only under the microscope. It is just simply marvelous! See those two tiny air bubbles, hardly larger than pinpoints: Even those bubbles are repeated in every one of the six sections of this crystal. So are all the dozens of other details. There's law and order for you! Each snowflake is as different from its fellows as we human beings are from each other..."
and it was he who discovered that no two snowflakes are alike. He should know... he took over 5000 pictures of them. Follow the links throughout this post to find out more. 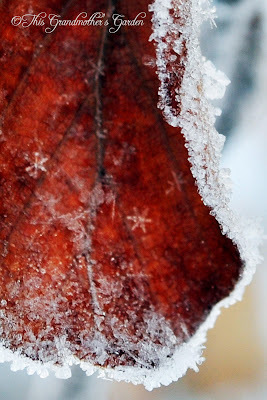 into geometric shapes as they freeze. the temp here is 11°F. Before his death, the Snowflake Man wrote a letter to the Smithsonian Institute. He was concerned that his life's work might be destroyed or lost. They agreed to take 500 of his pictures and archive them. Visit his Image Gallery at the Smithsonian and you'll appreciate more the work of this great man... I sure do! Just occasionally brave, Pam. Honestly... I don't like being cold, but like Snowflake Man, I can often tell if the snow is good to capture sweet images. Very cold and light flakes in the air...a perfect setting for magic! All of these giveaways are very nice and a neat idea to grow your blog. 11 degrees!!!! Yikes! Your pictures are simply superb. I just feel joy at them and not cold at all. So glad you enjoyed the butterflies. Cason is SO interesting! I've not explored Calloway Gardens all that well but hope to one day. I did not know Cason was the name of the founder of the gardens and also a ship. A great story indeed! Hi Carolyn, what a beautiful post, I am not a winter girl, but I appreciate the beauty in your photos. Your photos are extraordinary! What a beautiful way to begin the day. Thank you for sharing. Wow -- you are magic with that camera!! What a beautiful iris, and a generous giveaway! I hope you'll visit my blog, too, during the Party! Your pictures are amazing. I love flowers and visiting gardens. Unfortunately I don't have the time or the patience to tend my own. I do admire the time and effort put in by others. I will have to explore your more. You have a lovely blog with lovely pictures and I'm a new follower! Have fun at the 'Grow Your Blog' party! So nice to admire your blog, the photos are amazing. Thanks to Vicki I'll visit your blog again, the pictures are so wonderful. Caroline: your photography takes my breath away. This is so beautiful. You are an artist with the camera. I found your blog last year and have been following ever since. I love everything that has to do with gardening. A lovely and informative post, I can understand why you went outside in such cold weather your images of frost and snowflakes are magical. OMG! I am so lovin' your blog! 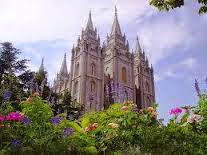 It is simply stunning and you can believe me when I say I will be back often for visits! What a fabulous post! I am almost speechless, not an easy task for me! :D Thank you so much for sharing this post with us! I am your newest follower by the way... can't let you blog get lost in the vast land of blogs! What beautiful pictures! You have a very lovely blog. I'm a retired teacher and have read Snowflake Bentley to my students many times! Both my students and I never tired of his story or his work. Your photos are just lovely! Yes, beauty is everywhere! 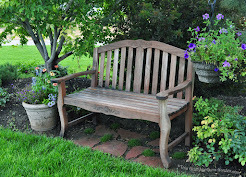 Your blog is just wonderful and all of your gardens are simply gorgeous! I am so glad I stopped by. Love all the snowflakes and your fabulous photographs dear Carolyn...and what a wonderful giveaway...that much loved iris that I have long admired...what an honor to grow a piece of it!! 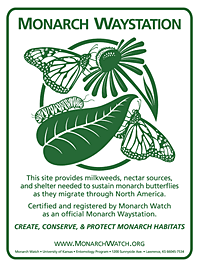 We have much in common, not just gardening but gardening for wildlife. Your photography is awesome Carolyn and I shall become a regular visitor. I visiting from Ontario and hope you'll come over to my blog for a visit. i am now signed in - sorry to leave 2 comments ... the last comment was mine. 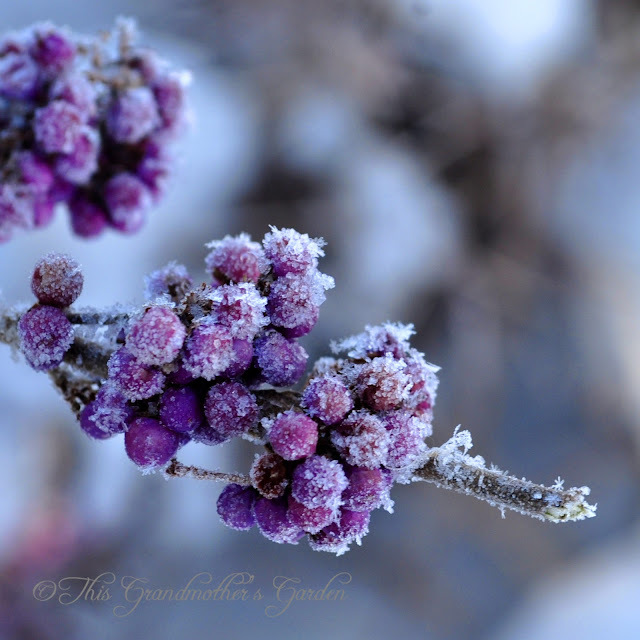 Such beautiful frosty images, I love winter. Thanks so much for stopping by my blog! What an awesome site the mountain must be. And the story about the Snowflake man is really interesting. Snowflakes really are magical. ♥ Thanks so much for visiting with me and leaving a comment. I have photos of what my giveaway will include if you'd like to pop back in to take a peek. It wasn't posted when you visited with me the first time. Люблю зиму прекрасно что есть люди которые замечают эту красоту.Ведь не каждому дано видеть это.Я люблю ваш блог мне близки ваши мысли.Спасибо вам. Hello Carolyn, I am so happy to meet you! Isn't this blog party totally amazing? I have met so many interesting and kind people already, and I am very glad I have been able to visit you. Your blog is very inspiring! I enjoyed reading your post about the snowflake. I have always been interested in this. I just visited the Smithsonian site with Wilson's pictures....fabulous! Wow! Thank you so much for sending me over there. I would love to have a chance to win your beautiful flowers. thank you! p.s. I couldn't find your "followers" section. STUNning photos........what a gift you have! Popped in from GYB and it was so worth it! I'm new to your blog. I have been enjoying it! I'm also trying to actually enjoy winter a little more and not just hibernate! I moved to Washington from southern Missouri a couple years ago, and my spring fever that year started in December! Now that I know I have to wait until April for spring, I try to keep a better handle on it. :) Also, I've been putting in the earliest spring bulbs I can find to help tide me over. 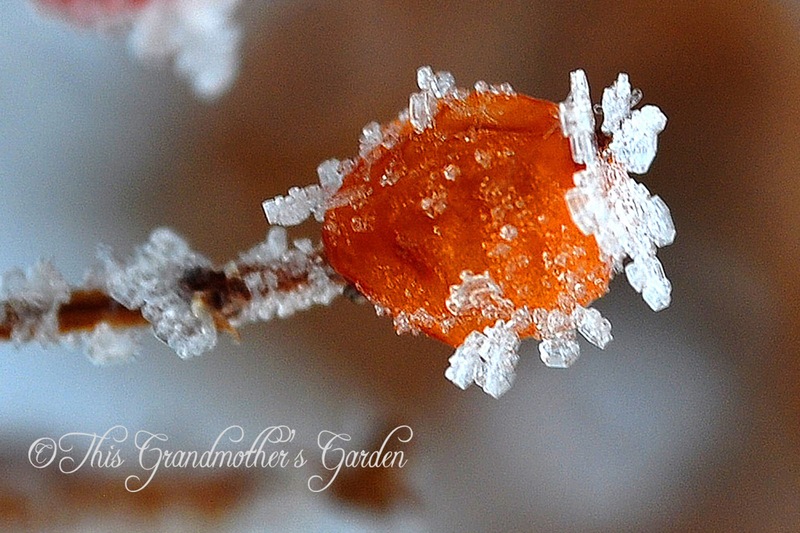 What magical photos of your garden in winter touched with snow. Those beautiful snowflakes.... something I rarely see. I'm now following your blog and I would love you to come and visit me to enter my giveaway and follow me too. I'll be back to visit when you post again and then I can have a good look around. I'm a Grandmere with a garden too! Magical pictures and heart warming information. Beautiful blog and I love all your photos! Your post gave me a sweet trip down memory lane... thanks, Tina! Thanks for making the "trip" to visit me! It was certainly a great start to my day... but a cup of hot cocoa was much needed when I returned to the warm side of the window. Laurie I'd love to visit... but you didn't leave your link. Thank you, Evelina... and thank you especially for leaving your link. LOVE LOVE LOVE that someone actually did. So glad you did, too, Brooke! Oh! Keep breathing, Oma Linda! And do come again! A heart-felt thank you! Would love to return your visits... leave a link? It as easy as clicking "optional link to your blog" in the comment form and entering your own URL. I thought so too when I discovered them in my images after I uploaded them.... magical, indeed. Thank you Kathy... please leave your link next time you visit so I can find you! I am honored, Beth. Next time you come, please leave your blog URL by clicking on the "optional link to your website" in the comment form. Then I can visit you! I think so, too! Thanks for coming! I am just fascinated by his story... and read everything I could find in researching for this post. Was thrilled to discover there is a children's book of him. Love that you found me! Next time you visit.. please leave your link so I can visit you! We find such joy in the wildlife that visit our gardens... glad to share it through my images! Sweet! You saw the "optional link to your website" in the comment form and added your URL. See how your name is highlighted and your picture pops right up? Now anyone can click on your name up there and they're taken directly to your website. A brilliant idea... if only my visitors would use it. I do love Winter, too, Barbara. Thanks for coming! 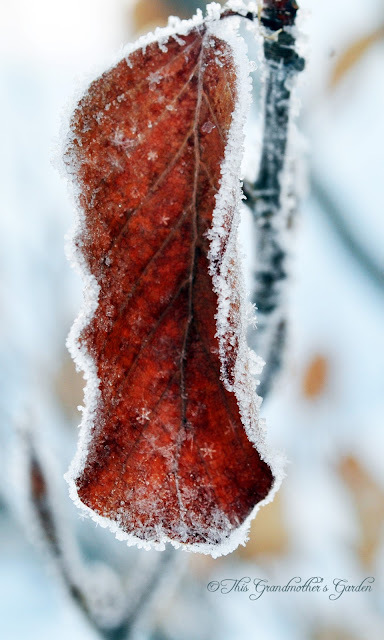 "Love the winter and that there are people who notice this beauty. Because not everyone is given to see this. I love your blog I close your thoughts. thank you." So glad you found my blog... hope I got the translation right. 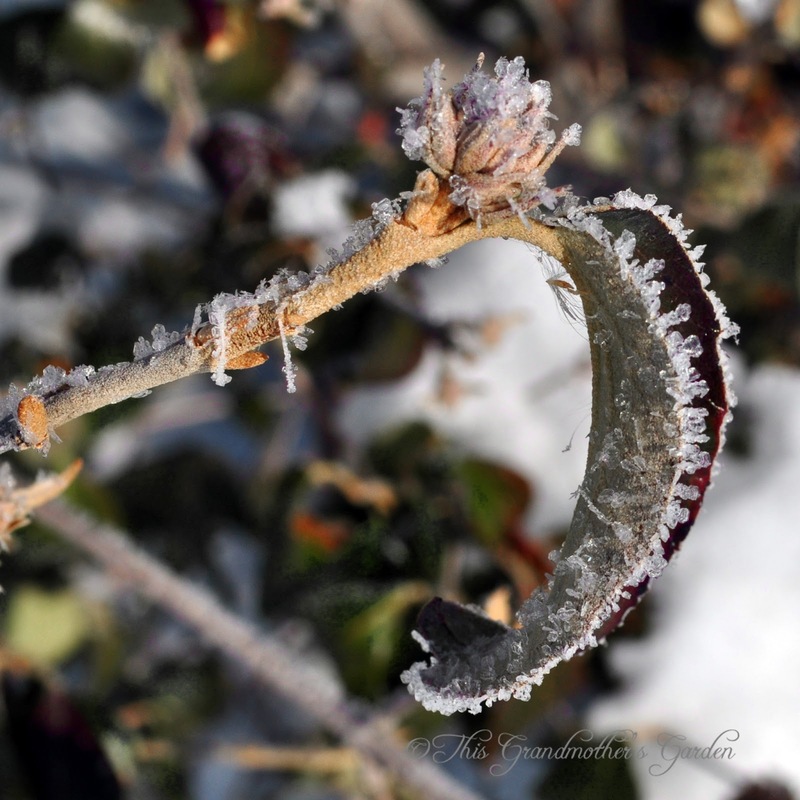 I do find great joy in discovering the beauty of Winter... now if it just weren't so cold out there! I love being a Grandmere... don't you? 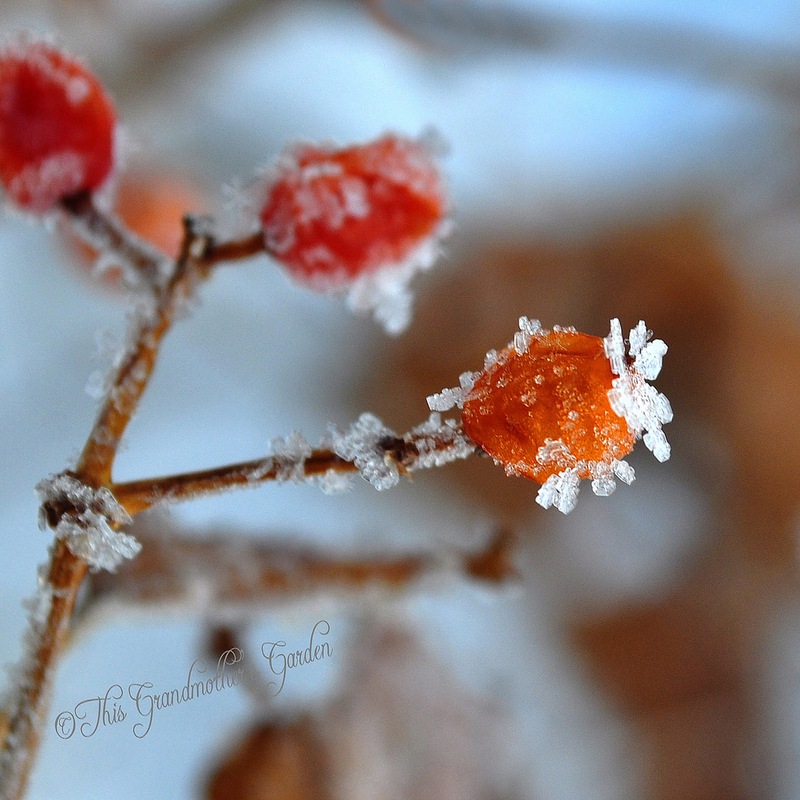 Oh Carolynn, you've renewed my love of winter...and frost, and snowflakes, beautiful shots. What a lovely post and photos! Thank you for visiting my blog, and I'm glad to get acquainted with yours! Marty is in love with you now for remarking about your fondness for rabbits. While I'm not looking, he might stuff the raffle box with a comment like that, LOL! That iris color is downright gorgeous too! We don't have any planted here at our new place (we have about 1% of the space we used to have, and I'm not exaggerating! ), but I would manage to find room for a start of it somewhere! 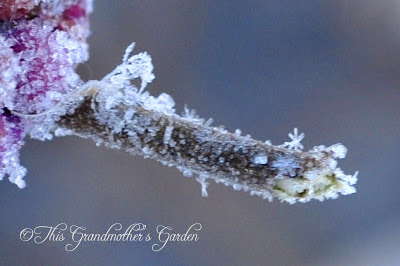 I love this post : ) The Snow Flake Man is amazing with all of the study he did on these little miracles of science and nature .. it is hard to believe that there are no two alike in the world ! .. I love looking at them because they are nature's "art" pieces aren't they ? Loved this post and I have to peruse those pictures again! Great photos. Any friend of Snowflake Bentley is a friend of mine! Your photos are amazing. We are already starting to have warmer weather and don't usually have frost. I love how you caught all the little bits of frozen ice on the different plants. Hi, I am visiting from the Grow Your Blog event. It is save to say that I am just blown away by the beauty of these images. Amazing. So much beauty in the world and most people never see it, because they are looking at only the big picture ... they never see the beauty in the little things. Please include me in your give away. And visit me if you have the time. First of all, can I think you for visiting my blog. I must say I am delighted you did, otherwise I might have missed this glorious set of pictures with a bit of history to go with them. It's amazing what the naked eye can't see. When I've more time on my hands I will be back to explore your site. 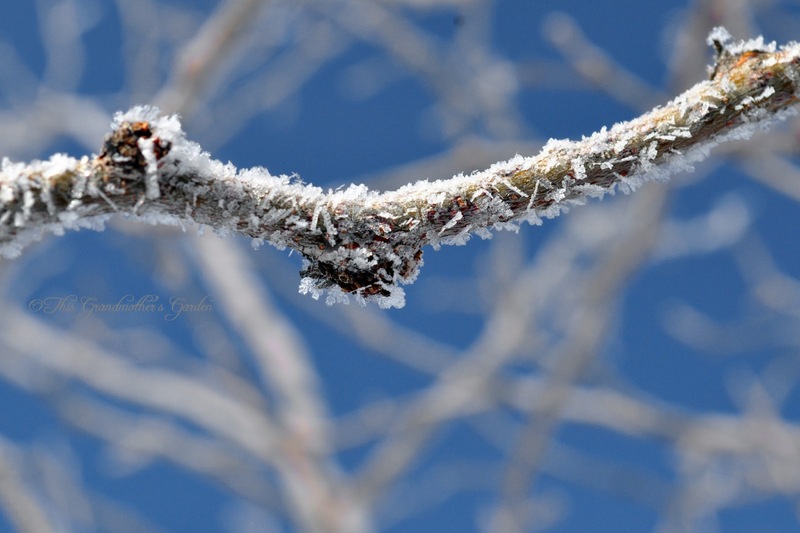 I very much enjoyed your lovely photos, I live in a winter wonderland as well, frsh frost on a sunny day can be breathtaking. Carolyn I love those crisp sparkly leaves. Carolyn, these photos are beautiful! Thanks for getting out in the freezing cold to take them. Magic jewels, indeed! I enjoyed the info on the snowflake man. I visited the links you gave, and his work is amazing. We actually had a brief snowfall here last week, but I was at work and the snow was gone by the time I was off work and could have enjoyed it. I've had such pleasure in stopping by your blog as part of the GYB party. Your photographs are exquisite...and the post so interesting to read. I'm a Brit but living here in Australia and sweltering in 40 degrees celcius today. You've succeeded in cooling me down perfectly just by looking at your pics. Thank you so much for sharing. Thank you for coming, Leslie! Snowflakes are quite magical. Always looking for new things to share in the landscape I'm blessed to tend. Thanks for coming! Oh please do come again... we have such fun here! Oh and I do, too, Catharine... thank you for visiting! Stay warm! You are so kind... thank you for visiting. So glad you found me! Thank you for visiting Cranberry Morning today. It is wonderful to meet you. Love your beautiful blog. Bentley was such an interesting man; thank you for introducing us to him! I so agree with you, that we are stewards of this earth God has made. As Christians, the mandate God gave to Adam and Eve to subdue the earth and care for it has been passed on to us, not cancelled. Many blessings. I so enjoyed your beautiful photography! I'm simply amazed with this informative and educational post of yours. I've never thought that one can actually photograph them. I'll try this out the next time I'm faced with snow. girl...your garden is gorgeous in winter too!!! Wow...your photos are breathtaking! I am Tootsie..(Glenda) and I am your newest follower...and very happy to say so! I would like to invite you to link into my weekly gardening party that starts Thursdday evening and goes until Sunday night every week...it is a flaunting of all things growing, or beautiful in the garden...and your blog fits perfectly! 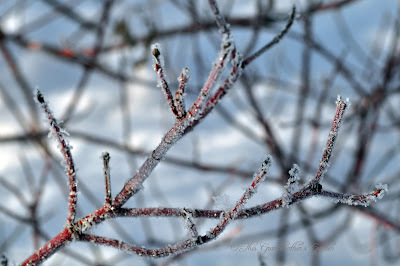 I hope you will check it out...hugs from in the bitter Cold weekend in Alberta Canada! So happy to meet you, too! Out of so many posts I've written, this is surely one of my favorites... first to discover those tiny snowflakes as I enlarged the images, then to discover Wilson Bentley as I did a little research. Love it when I learn something new and can pass it along to my readers as well. Oh and please share with me what you find! Oh my! It takes a lot to get me out into the bitter cold of winter, even if it means photos for my blog. But your snowflakes are awesome! I guess I'll try it next frosty morning. 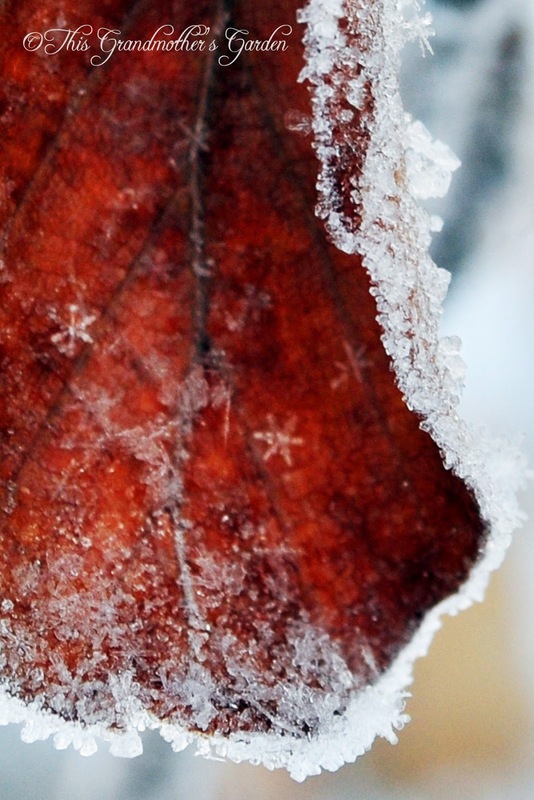 Glorious photos of the snowflakes and ice! Love that beautiful iris too and would love a start of it!